BROCK BAJ'ER: Oh Boy! Where's the yard sale?! It’s the Great American Past-time: everyone loves a yard sale! We're all "American Pickers"! You might find the treasure of a lifetime for a dollar! You’ll never know adventure till you follow the “humongous yard sale” sign! 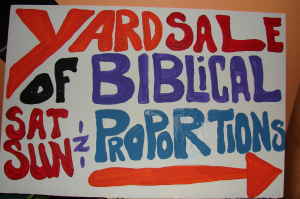 This sign for the biblically proportioned sale was featured on Best of Craig’s List and scored big-time hits. Yard sales are a treasure hunt for the buyer and an opportunity for the seller to "de-clutter" and be rewarded for their effort. I can't imagine suburbia without this traditional exchange of goods. For some it is a humbling experience: they're paying the rent or moving from foreclosure. It's vitally important they make a sale. It soothes the soul to see family treasure go to another family. In fact the history of yard sales goes back to the Depression era when families pared down belongings to what would fit in their vehicles as they moved to where the work was. Belongings were sold to those left behind. In all honesty that act preserved Mid-western American history as artifacts were salvaged and saved. Some of the best attended yard sales today advertise "Antiques, Vintage and Collectibles". Sunland Tujunga has yard sales every weekend. In fact it is the go-to place for yard sales! Residents and visitors attend church, then go to yard sales, the farmers market and Sunday dinner at a local restaurant. It’s tradition. You can travel the commercial corridor of Foothill Boulevard and see dozens of enticing signs beckoning you to follow them to the "sale of sales"! They are splendiferous in their artwork and neon colored creativity as posters cry to "buy our great stuff"! More visitors (and their pocketbooks) are encouraged to come to Sunland Tujunga every weekend to spend money at yard sales than are drawn to local businesses. But while they're here they shop Sunland Tujunga's stores, attend the farmers market, and eat Sunday brunch! Surrounding communities have severe restrictions on yard sales which makes Sunland Tujunga's all the more unique to the community. The problem is the ordinances for yard sales and signs are not in agreement. Are yard sales legal? Are permits required? What about those signs? What are the rules? There's 'good news' and 'not so good news'. Yard sellers can breathe a sigh of relief! Yard sales are allowed in Sunland Tujunga by the Planning Commission and the council's Planning and Land Use Management Committee. Sellers can have up to five sales a year for two days each, totaling 10 days and they must be between the hours of 9 am to 5 pm. Goods for sale must be used items belonging to the sellers. New merchandise is prohibited. No permit is required. Originally limited to two sales per year, this was amended to five per year in 1996 by then Councilwoman Jackie Goldberg. The yard sale ordinance is enforced by the Department of Building and Safety who depends on a self-policing community with community members reporting violators rather than having limited personnel in the department keep track of the number of sales per site. "A self-policing community" is a crucial element to continued yard sales and removal of out-of-date signs! Here's the rub: The signs (including signs for lost pets, farmers markets, and rentals) are in violation of Los Angeles Municipal Code Chapter 6; Article 7; Section 67. Granted they are deliberately overlooked and even allowed by the city. After all how do you find a sale without the sign? Craigslist only brings a small percentage of buyers; the majority who simply arrive in the community expectantly looking for signs never read Craigslist. A poll at several yard sales finds those who follow the arrows on signs have driven to Sunland Tujunga to look for the signs. One buyer said "I really like your (community's] quaint country ways and funny homemade signs" she and her friends "come here every weekend for great fun." When asked how much she spent she laughed, "more than I want to say." Joseph Mailander, the author of the blog Street Hassle sent this insightful e-mail: “Given the city's penchant for permitting …every stripe of commercial billboard blight imaginable, it's almost unbelievable to me that they would codify anything additional at all about handmade signs. To me, this is just another case of narrow but squeaky commercial interests bullying broader but quiet residential interests. "There is already an enormous gulf between de juris and de facto practice here, and why add to that? Given police resources, I can't believe anyone wants to further burden the LAPD or Planning Department with more code enforcement and calls ratting out strapped homeowners for putting up garage sale signs." Mailander adds a suggestion many have already voiced "…we have an unwritten policy in Los Feliz: if you put up a sign in the morning, take it down in the evening. It's a word-of-mouth, neighborly policing, and it's very effective. Generally, as a garage sale sign has an address on it, if the neighbor doesn't take down their signs, someone will slip them a friendly note the next day." An easy conversation with Councilman Krekorians aide Jeremy Oberstein, resulted in the suggestion this blog present its idea of self policing to the community. So, it should work the same way it does for visitors to Big Tujunga Canyon: "pick up behind yourself and someone else."